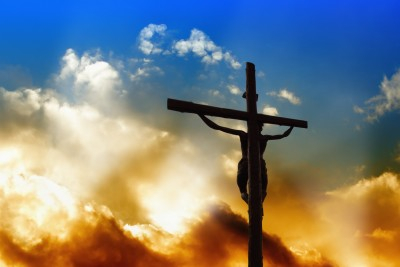 As the years progress and I am in this season of my life, I realize that Good Friday means something different than it did when I was a child. Even today, I remember our traditions and the traditions of the church in which I was raised. On this day of remembrance I pray that you will understand the importance and the symbolism of this most solemn day in Christendom. As a child on Good Friday my Mom and my sisters and I spent much time in church on this day. I attended a Catholic church then and on that day no Mass was held, instead we did the Stations of the Cross. This was a time when we would be led by the Priest in visiting various “stations”, identified with pictures that hung on the wall. We would begin with the first station: “Jesus is condemned to death” and move around the church perimeter reciting prayers all the way through to the last station (14th): “Jesus is laid in the tomb”. As a child this process saddened me as I studied the gruesome pictures that hung on the walls all year, never to be noticed until Good Friday. Depending upon how many people were present it could take up to 2 hours to complete the stations. After the stations we usually had Holy Communion. I remember too that this was the one day that the Host (now called the Eucharist), was in the Monstrance on the altar. This Monstrance was a solid gold container of sorts that looked sort of like the sun with rays carved into the gold. I don’t remember seeing the Monstrance at any other time. The Host was in the center of this golden holder. As children we were not required to fast, but the ones who where over the age of 14 were to abstain from meat on Good Friday and fast – which meant that they could eat 3 meals and no snacks. Good Friday was not considered to be a Holy Day of Obligation, so the church was usually pretty empty. He purchased me with His blood! I was a grown woman when I learned the truth of the gospel. It was then that Good Friday became something more. Although Christians regularly recall the crucifixion of Jesus; this is the day that the cross at Calvary is illuminated. I have had much opportunity to listen to the preaching of the Cross and to understand the significance of what Jesus did for me. Prophesy was fulfilled at the cross; He was despised and rejected and we esteemed Him not; He bore our griefs and carried our sorrows. Were you there when He rose from the grave? I am just a sinner saved by grace and everyone who believes in what Jesus did over two thousand years ago can claim the same victory as I – eternal life because of Calvary. It was a cruel, dark and sorrowful day; the day my Jesus died. BUT, it was a Good Friday because it was not the end of Jesus’ life, it was the beginning of the miracle of the Resurrected Jesus — the Savior of the world. Jesus died once for all. He finished his work and now He is seated at the right hand of the Father (Hebrews 12:2). One day He will return to redeem His believers — are you a believer? Don’t delay, He could come at any time. Won’t you come to Jesus today? I am sorry you and your family missed the truth of Jesus Christ and his saving grace that is the heart of Catholic Christianity. I found Calvinism to be judgemental and fearful of Jesus, and many evangelicals considered their faith as an insurance policy only. In the Catholic Christianity as read in the Gospels and Catechism, I find Jesus, who loves the whole world and each person in it (John 3:16). Hi Amie, Thanks for leaving your comment here at WCWTK. I have many Catholic friends and family that have found a personal Savior in Jesus, sounds like you are one of them too, Praise God for that! I have studied Calvinism and do not hold to the tenets of that denomination. I read the Bible and that is how I learned about grace through faith. I am thankful that I know for sure that Heaven is my home when I leave this planet and while I am here I will continue to share the good news of the Gospel. Please forgive me if you were offended by anything that I wrote in this article. I was simply sharing my personal story and meant no no harm. I pray that you have a blessed Easter and hope that you come back again to visit us here. Thanks for sharing such an awesome story and testimony. It is so great to here testimonies as you never hear the same story twice! So true Josh, I never quite thought about it that way. Thanks for stopping by and leaving your kind words here. I pray that you and your family have a blessed Easter! This was an amazing personal-reference article Pam. I am so blessed to know you and how your articles must be making an eternal difference here. This site would not be the same without you my friend. I love what Josh said because each personal testimony is like a snow flake and both unique and beautiful (no two alike). God bless you and your family and have blessed Easter. Thank you brother for your kind words. You know that the words flow from my fingers only because God has inspired me to write for Him. He gets all the glory. Happy Easter Jack! Your story could be my own … although there are many, many raised in the Catholic Church that know Jesus as their personal Lord and Savior, I was raised in a Catholic Church that did not teach having a personal relationship with Jesus; I did not even know there was a Bible. As a young adult, God answered my seeking questions, and through a friend, I was brought to a non-denominational Church that simply taught straight out of the Bible verse by verse. It was here that I learned about Jesus’ love, mercy, and saving grace. I have confidence now in my salvation instead of fear of judgment and the unknown. Your testimony touched me in a very personal way as I could have written the same words myself. Thank you for posting so eloquently “my” story. Blessings on you and yours this Easter. Beautiful description of why it’s called Good Friday Pam. Wow. I think what was a very horrible bad day for Christ ended up for much good for those who have repented and trusted in Him and it will continue to be “Good” for all eternity for those of us who will enter that kingdom and for those who will later come which according to what I think, will be a kingdom that will increase with no end. Thank you my sister. I enjoyed reading this, thank you for sharing it. Previous post: How Does The Bible Define The Term Wrath?